The people I've met so far are kind and friendly. After an introduction, they will smile warmly and say, "You are most welcome." Yesterday I took a matatu mini-bus around town, which was quite an adventure. Picture 15 passengers jammed into a small VW van which has seen much better days. 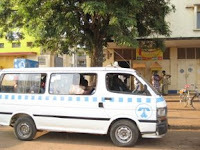 The conductor (the person who collects the fare, not the driver) was speaking to me in a local dialect (Luganda, perhaps) and I didn't understand a word of it. Other passengers tried to intercede in English. "Where did you come from?" one woman asked. "From the United States," I responded, not catching her drift. "No," she giggled, "What stop did you get on from?"